The Sigma 24-105mm f4 DG OS HSM Lens Sigma Fit is a high performance, wide-angle to mid-range zoom lens specially designed for digital SLR cameras with a full-frame sensor, but is compatible with APS-C sensors too. Its constant aperture of f/4.0, OS (Optical Image Stabiliser) and HSM (Hyper Sonic Motor) enhances the lens' usability in low-lit environments. The Super Multi-Layer Coating reduces flare and ghosting to ensure sharp, high contrast images even in backlit conditions, while the Hyper Sonic Motor ensures silent and smooth focusing with full-time manual override for precise adjustments. 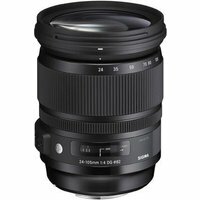 The Sigma 24-105mm lens features a minimum focusing distance of 45cm and is also compatible with Sigma's USB dock allowing photographers to update its firmware and change focus parameters using Sigma's Optimisation Pro software.